Radiation therapy has been around for decades. While it’s effective, standard radiation requires daily treatment over several months and can sometimes cause damage to surrounding tissues. However, advances in technology are now providing more targeted delivery, allowing for shorter treatment times and less collateral damage. Currently professor and chairman in the Department of Radiation Oncology at the James Graham Brown Cancer Center, University of Louisville, Dr. Woo was born in Malaysia and entered medical school there at the age of 17. He came to the United States to further his training and completed residencies in pediatric oncology at Georgetown University and radiation oncology at Stanford. Before coming to U of L, Dr. Woo led stereotactic radiosurgery programs at MD Anderson Cancer Center and Baylor University Medical Center, both in Houston, Texas. Dr. Woo was drawn to Louisville because the prevalence of cancer and potential for new technology offered the opportunity to make a bigger impact on a larger number of people. Stereotactic radiosurgery or stereotactic radiotherapy are general terms that describe a high dose of radiation precisely administered through small beams focused on a single point. Stereotactic radiosurgery refers to radiation to the brain, typically accomplished in one treatment. Stereotactic radiotherapy refers to radiation to the body and is accomplished in two to five treatments. CyberKnife is unique in that it combines a linear accelerator, which produces the radiation beam, with a flexible robotic arm that moves the treatment around the patient. It also includes a GPS-like tracking system that locates the tumor with pinpoint accuracy and adjusts for any movement during treatment. One of the biggest advantages of CyberKnife is that it allows for greater patient comfort. With the Gamma Knife, an older stereotactic radiosurgery tool, pins are put in a patient’s head to prevent any movement during treatment. CyberKnife’s GPS system allows for treatment without pins because real-time tracking adjusts for any movement. Other benefits? There are no incisions, no aesthesia, no pain, little or no recovery time and minimal exposure to radiation. The most common conditions treated by CyberKnife are malignant brain tumors that have metastasized from another cancer site. CyberKnife can also treat benign brain tumors, such as acoustic neuromas, and a benign condition called trigeminal neuralgia. In the body, CyberKnife is effective for early stage lung cancer and certain cases of prostate, spine and liver cancers. “Today, early stage lung cancer can be equally cured by surgery or a special radiation treatment,” says Dr. Woo. In each case, CyberKnife drastically reduces the course of treatment. For example, standard radiation treatment for prostate cancer is about 40 treatments over seven to eight weeks. With CyberKnife, it is just five treatments over two weeks. CyberKnife is one of three stereotactic tools available at the James Graham Brown Cancer Center. The other two are TruBeam and TomoTherapy. Each has different characteristics that perform better under specific circumstances. Ultimately, individualizing treatment to each patient to optimize the chance of survival and minimize damage to healthy tissues is key. 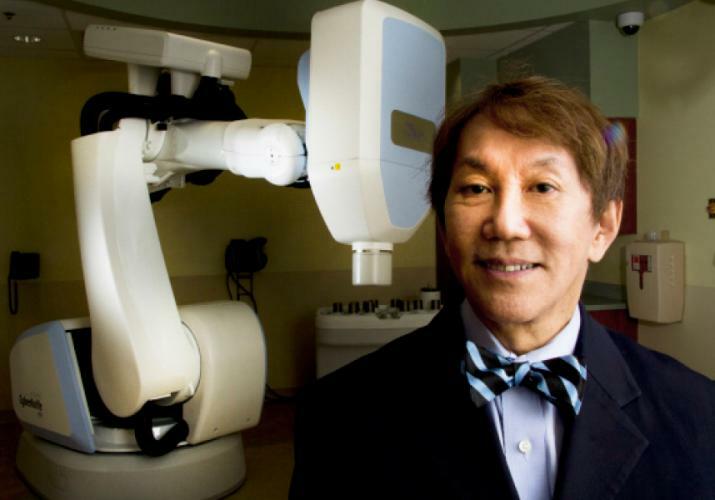 “CyberKnife is not for everybody or for every situation,” says Dr. Woo. If you have a challenging case or want to explore your options, Dr. Woo emphasizes getting a second opinion at a center that has a variety of advanced tools.